The Attendance report documents days and hours spent schooling. You can print an Attendance report for any date range and choose to show or hide the Attendance Hours you are tracking with Time Spent, Sessions or Manual Hours in the attendance entries. Each Student's attendance will be displayed on a separate page. 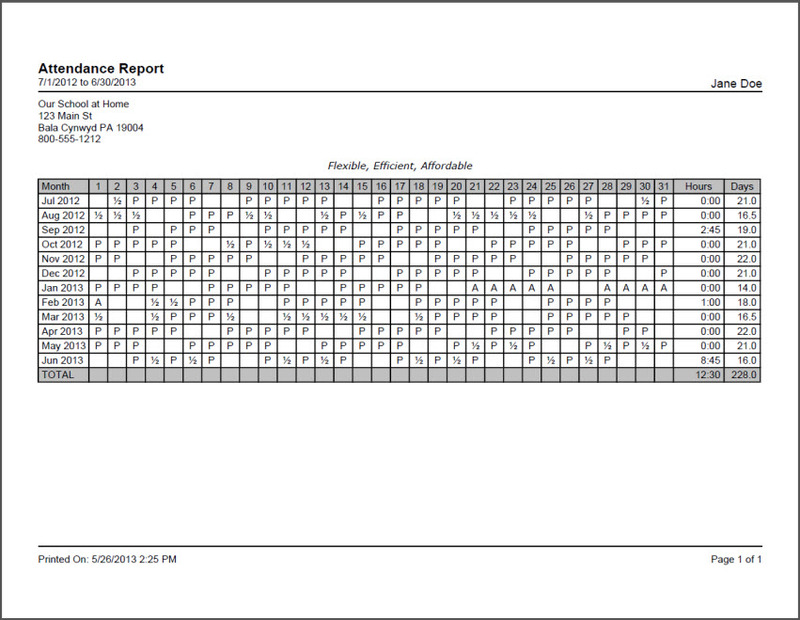 The default name for this report is: Attendance Report. You can change the Report Title to anything you like, up to 150 characters. Show Hours: This option will only appear if you have selected an option other than 'None' in the Time Entry section of the Attendance Options. If you are tracking hours in your Attendance records, you can then choose to have those hours - Manual Hours, Time Spent, or Sessions - displayed in the Hours column in this report. Motto/Verse: Choose whether to have your School Motto/Verse (that you entered in your School Profile) printed on the report above the Attendance grid. 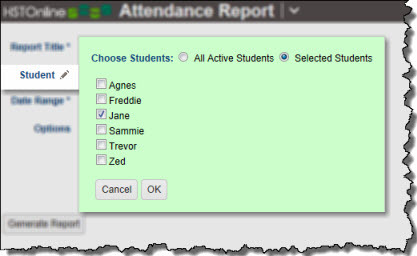 Phone Number: Your School Name will always appear in the top left corner of the Attendance report. Use this option to choose whether or not to include the School phone number as well. Street Address: Your School Name will always appear in the top left corner of the Attendance report. Use this option to choose whether or not to include the School Address as well. 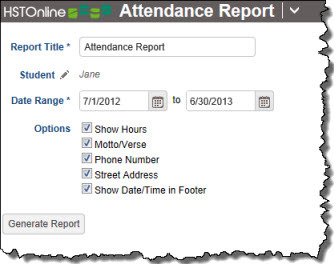 Show Date/Time in Footer: Choose whether to display the date and time when the Attendance report was generated. The date and time will be determined based on your Time Zone settings. On the HSTOnline menu, click or touch 'Attendance' under the 'Reports' section.